Bird Observatories are located all over the UK and Ireland, on the coast or on islands. 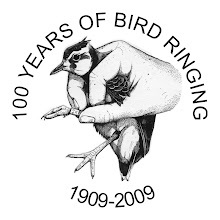 Their primary purpose is to conduct long-term monitoring of bird populations and migration, and encourage volunteers, particularly ringers, to aid in this study. Skokholm off the Welsh coast, was Britains first accredited Bird Observatory in 1933 but closed down its ringing activities in 1976 when the landlords decreed that no trapping would be allowed. 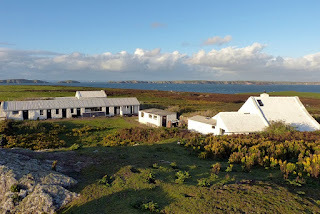 However the Wildlife Trust of South and West Wales was able to buy the island in 2007 and in the last couple of years has been busy refurbishing the accommodation and has recently introduced ringing activities again alongside a rigorous recording system with the objective of once again becoming an accredited Bird Observatory. In the last two seasons a small number of birds has been ringed during work party weeks but this limited activity has already produced a number of controls including the eighth Reed Warbler from Germany, Sedge Warbler from Scotland and Willow Warblers from Ireland, Scotland and southern UK. In 2013 the island hopes to continue ringing (with the aid of a new Helgoland trap, increasing the total to three) and nest recording, as well as instituting some new studies on Puffins and Manx Shearwaters. Skokholm, like any top migration site, can be a stunning place on the right day and will provide some valuable data for conservation. Thanks to Steve Sutcliffe for letting us know and for the photos.